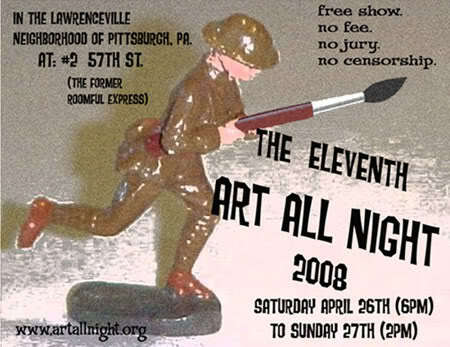 Art All Night turns 21 this year and like many Pittsburghers who turn 21, Art All Night is heading to the South Side to celebrate. Thankfully, the Carson Street metaphor ends there. Everything about the event is the same, except for the location. To get to Art All Night this year, you will have to cross a river (or two depending on your route) to the South Side. The 21st annual Art All Night will be held at the Terminal Buildings (which have been renamed The Highline, but this is a Pittsburgh blog and we prefer to give directions that would make sense to most Pittsburghers.) Art All Night everyone is invited to submit one piece of art to be displayed in the show. Last week, I caught up with an old friend for lunch where we reminisced about local politics, talked about Hq2 and waxed poetic about the transformation of Pittsburgh from then to now. Pittsburgh has changed a lot in the past 30 years and one of the neighborhoods that has undergone the biggest transformation is Lawrenceville. If I had to pick one event that created a ripple effect for years to come – Art All Night might be that event. (I would love to hear your thoughts on events that had an impact on Pittsburgh! Please share in the comments below). You can read more about the history of Art All Night here. To attend: stop by any time between 4 pm on Saturday (April 28, 2018) and 2 pm on Sunday (April 29, 2018) – yes, this event is 22 consecutive hours of art. The entire event is free to attend. To display your art: register online here and drop off your art between 10 am and 2 pm on Saturday, April 28, 2018. Follow the Facebook event here and @ArtAllNight on Twitter here for updates. This is a 100% free event. If you would like to help make sure this event is a success sign up to volunteer here. Registration: Register artists and check in their artwork, move art to the staging area. Parking and Traffic: Help control the road and pedestrian traffic by the buildings. Security: Oversee event space area to ensure no accidents occur and that safety and security protocols are met. Hangers: Move the artwork from the staging area to the appropriate display area and curate/hang the art. Green Team: Help keep Art All Night Green! Manage the recycling and trash receptacles. Art Sales Table: No sales take place, but staff the table in order to collect contact information of interested buyers so they can be given to the artist when they pick up their artwork after the show. Sales Table: Assist in the selling of merchandise. Volunteers: Help the volunteer captains manage incoming volunteers and ensure all volunteers receive their t-shirt upon volunteer check-in. Kitchen: Collect food donations as they come in for the volunteer team, keep food area neat and clean up at the end. Stage: Assist bands and performers at the stage area. Take-down: Remove art from the displays at the end of the show on Sunday at 2 pm. Art Pick-Up/Check-Out: Checking artists’ IDs to make sure the right person has the correct piece of art. Tear-down: Take down the display panels, pack our supplies, and clean the building on Sunday afternoon. Children’s Activities: Help facilitate the children’s activity areas. This includes interacting with children to get them involved in art projects. Interactive Art Assistants: Aid and monitor attendees in d.i.y. art projects. Artist Assistants: Help facilitate onsite artists. Duties may include moving canvases and art supplies. Onsite Art Clean Up: Assist with cleaning up lots and lots of paint, washing brushes and moving canvases late Saturday night. Art Auction: Help out with a live auction and enter bids into a computer system. 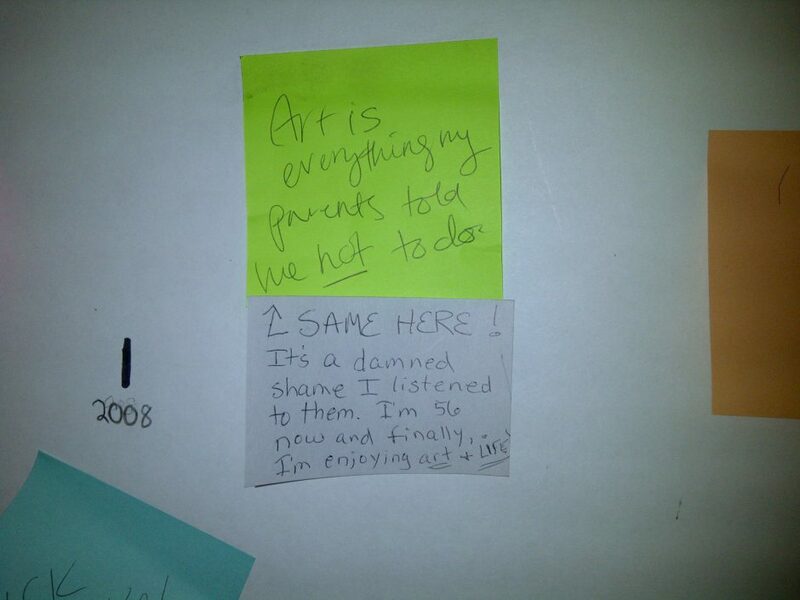 Read our previous posts about Art All Night here: 2008, 2009, 2010, 2014.